Diverse week long Rick Steves’ Istanbul tour aims to unfold the history of 3,000 years and the vibrant contemporary life of the city. Istanbul was Constantinople. It was first the capital of Roman Empire under the name Nea Roma, than the capital of Byzantines as Constantinople and finally the capital of the Ottoman Empire as Istanbul. There is no other city on earth that enjoyed being the capital of three great empires. The Rick Steves Istanbul tour includes the classic sites of Istanbul, such as the Hagia Sophia, Blue Mosque, Topkapı Palace, Bosphorus Cruise, Oriental Bazaars –the Grand Bazaar and Spice Market-, and more; but for me one of the most outstanding features of the tour is one particular city walk, The City Walls and Neighborhoods Walk. This walk is conducted on the 3rd day of the tour and titled as the Byzantine Constantinople in the tour itinerary. Rick Steves Istanbul group by the 5th century city walls of Constantinople with their guide Yaren. The core of the Old Town is home to the major historic monuments from Roman, Byzantine and Ottoman Empires. Everything you can seen today in this area are “huge”, “empiral” and “palatial”, reflecting the glory and wealth of the history. But, life was not always about empires, monarchs and tricks to hold the power. To be able to unveil the life common folk had and to hold light to the amazingly rich diversity –both historical and contemporary- of Istanbul, we included the city walls walk in the tour. This colorful walk takes us to the fringes of the historic city, to the City Walls of Constantinople which rank among the most impressive city walls in the world. Built in the 5th century, the 13 mile long wall was an impenetrable fortification for more than 1,000 years. Than, we visit a tiny, but beautiful church called the Chora Church. 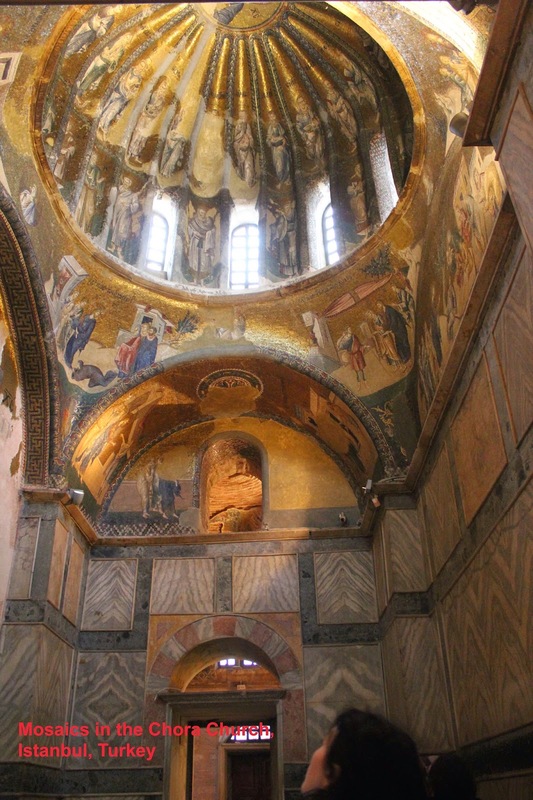 This little gem houses the best of the Byzantine mosaics. Every inch in the walls and ceiling of the church has decorations consisting of tiny pieces. Gold depicts the sky, hence dominating all the other colors and the church. If Hagia Sophia is Notre Dame Church in Paris, Chora Church is St. Chapelle. Less known, but not less valuable. Interior of the tiny Chora Church and marvelous mosaics. If If Hagia Sophia is Notre Dame Church in Paris, Chora Church is St. Chapelle. We continue on with the walk, meandering the Turkish, Roma, Jewish, Armenian and Greek neighborhoods. There are still many places of worship serving these communities, we see some during our walk. Colorful farmers’ market of the neighborhood is on of the local experiences we don’t miss. After walking thru market, we end our walk in the Greek Orthodox Patriarchate, the counterpart of Vatican in Rome. The Patriarch is the spiritual leader of approximately 300 million Greek Orthodox spread in the world. St. Gregory’s Church is the Patriarchal Church, it houses many important relics. For the Greek Orthodox, it is a privilege to visit this church, and join a mass, Holy Communion lead by the Patriarch himself. 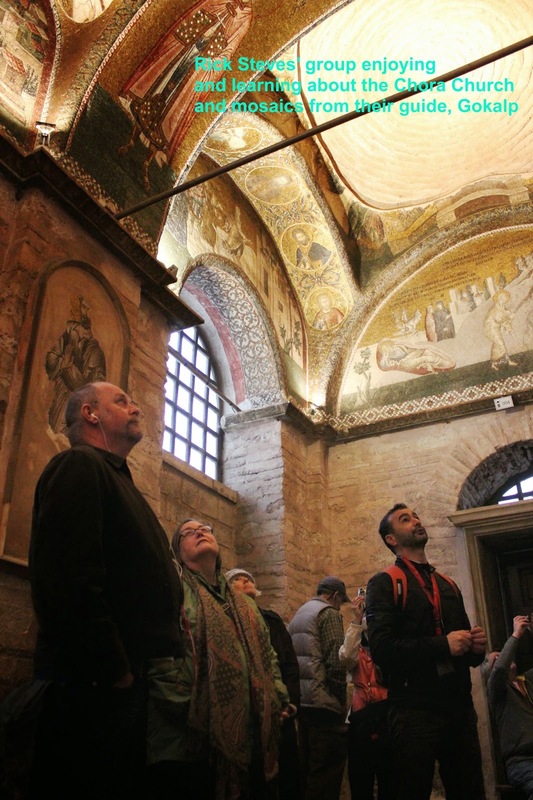 Rick Steves Istanbul group of March 2015 enjoyed the privilege of meeting with the His Holiness, Patriarch Bartholomew while they visited the Greek Orthodox Patriarchate. As for those of you reading this and will be in Istanbul during the next two weeks, you can join the Holy Week events hold in various churches at different days. Different Christian denominations in Istanbul celebrate the Easter and hold a Ressurection service in different days. The Union Church of Istanbul (a.k.a. the Dutch Chapel) is an interdenominational church and has a diverse congregation, reflecting the cosmopolitan nature of the city. This is also the place for the English speaking visitors, expats and Turkish speaking Protestants and Lutherians. On April 05, the sunrise service in this church will be at 07:30, there will be two Easter services at 09:30 and 11:00 am. The All Nations Choir will perform during the Easter services. For address and more information about this church and services, visit their web site at: www.ucistanbul.org. The Ressurection service in the Greek Orthodox Patriarchate will be on April 12. You can visit following web page for events and services calendar for the Holy Week: https://www.patriarchate.org/services.